This is a completely refurbished Two Bedroomed Detached Bungalow, positioned in this popular location to the south of Lincoln on Doddington Park, with easy access to the A46 Bypass and the City. The property has been improved by the current owners and offers modern, stylist living accommodation to comprise of; Inner Hallway, Luxury Modern Fitted Kitchen with integral appliances, Lounge with bay window, newly fitted Luxury Family Bathroom and Two Well-Appointed Bedrooms. Outside, there are gardens to the front, driveway and garage to the side and an extensive garden to the rear. The property is being sold with NO CHAIN, has gas central heating and uPVC double glazing. LOCATION Located on Doddington Park, close to the A46 Bypass, with easy access to the City Centre, where all the usual facilities are available. INNER HALLWAY With door to the front, radiator and doors leading to the Kitchen, Lounge, Bathroom and Two Bedrooms. KITCHEN 9′ 0" x 11′ 11" (2.74m x 3.63m) With uPVC window to the front, uPVC door to the side, fitted with a range of modern base units and drawers, with work surfaces over and stainless steel sink and drainer with mixer tap above. Integral oven and grill with a four ring electric hob, integral microwave, integral automatic washing machine, integral fridge and freezer, concealed wall-mounted gas central boiler, tiled flooring and partly-tiled walls with LED spotlights to the ceiling and radiator. LOUNGE 15′ 0" x 15′ 10" (4.57m x 4.83m) With uPVC bay window to the front and radiator. 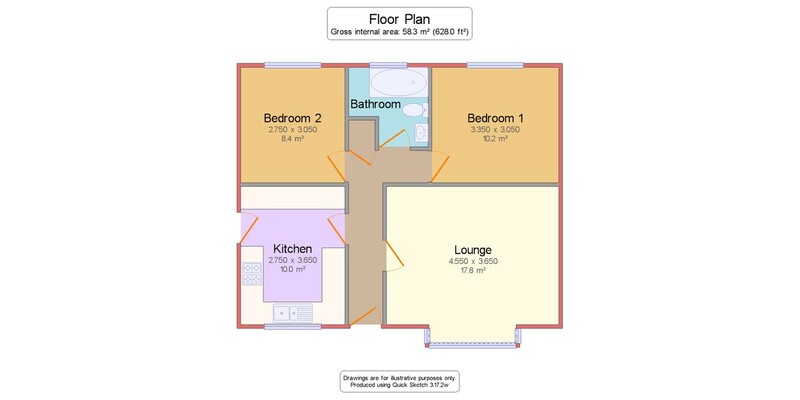 BATHROOM 6′ 9" x 6′ 5" (2.06m x 1.96m) With uPVC window to the rear, suite to comprise of; bath with shower over, WC, wash hand basin with vanity unit, tiled floor and a radiator. BEDROOM 1 10′ 1" x 11′ 0" (3.07m x 3.35m) With uPVC window to the rear and radiator. BEDROOM 2 9′ 11" x 9′ 0" (3.02m x 2.74m) With uPVC window to the rear and radiator. GARAGE 17′ 3" x 8′ 3" (5.26m x 2.51m) With up-and-over door to the front, uPVC window to the side with power and lighting. OUTSIDE To the front, there is a lawned garden with flowerbeds, mature shrubs and trees. To the side, there is a driveway providing parking for vehicles and giving vehicle access to the garage. To the rear of the property, there is a lawned garden and paved seating area.